UPDATE: The Discussion forums still work too. John Buckman over at the book-swapping site BookMooch recently announced a prolonged downtime. They caught some database corruption and will be down for a day or more. A word about them: BookMooch is only the first of the eleven swap sites LibraryThing integrates with (swap page). We let any swap site integrate with us, and we rank them by an objective metric, so if another site gets more popular, BookMooch will lose the top spot. 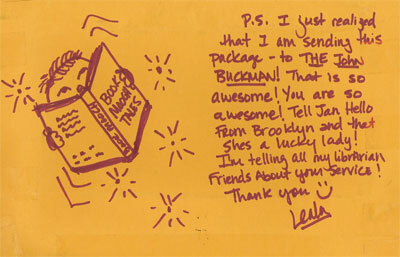 A card sent to John in a book shipment (blog post). It encapsulates a lot of this. You can tell John loves books because he’s using his own service. You can tell he’s human and open because the writer even knows his wife’s name. And you can tell he got community right because the librarian’s first impulse is to talk about the site with others. Passion. The whole site breathes a love of books and reading. It’s not faking it like a few book-related websites I’ve seen. John also cares about good design, and about making users happy. By all accounts, he’s not in it for the money. He sees the power of the idea** and wants to take it as far as he can. I think he will. Openness. BookMooch publishes all its metrics. If BookMooch’s rise were to stall out for a time, everyone would know. That sort of openness is, however, one of the reasons BookMooch has continued to grow so rapidly. John publishes his APIs. He blogs about everything, even the bad stuff. Most companies don’t get this stuff—that the default position should be “open.” John does. Community. Cataloging and swapping are not necessarily that social. Cataloging wasn’t social until LibraryThing and some other sites made it so. Book-swapping was, but swapping online doesn’t need to be. And because of the potential for fraud, abuse, lateness and so forth, online book-swapping can bring out the worst in people. The community can become dysfunctional. Instead, the BookMooch community has become a model one, working out their problems together and even reaching out for charity work. Shirky got it right: Love matters. And communities love very well together. Humanity. John doesn’t hide behind a “contact” link. He doesn’t have some marketing guy blog pablum. He speaks in his own voice, with personality and humor. People know him. He’s real. I probably overestimate the importance of this since I’m in an analogous position, but I think having a human face helps the other factors to work their best. Finally, some ideas for what to do while BookMooch is down. Read the books you mooched. Visit the BookMooch blog and leave supportive comments. Check out the BookMooch page on Wikipedia and improve it. It could use some improvement. Visit BookMooch on Second Life. I’ll be hanging out there off and on today. I’m sure John won’t! Check out the BookMooch Group on LibraryThing. We have a lot of membership overlap. *The ancient historian M. I. Finley says somewhere that, since the Phoenicians didn’t leave much in the way of written documentation, we know them primarily through the Greeks. What we know is all about their prowess in sailing, colonization and trade, which is to say what the Greeks saw in themselves too. I always think of that when I hear someone praise someone. **I also appreciate that Buckman takes his ideas on the road, speaking all over the world. I just finished his talk at “The user is the content” in Belgium. ***We’d offer to help—and did—but our systems are too different. BM is written in TCL. Mad!